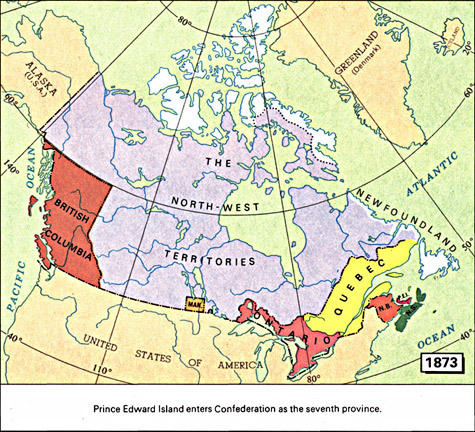 Prince Edward Island before Confederation was home to approximately 87,000 people. Most of the population was of Irish, Scottish, English, and Acadian descent, but there were also small Black and Mi'kmaq communities. Life had a decidedly rural flavour. Charlottetown was the only incorporated city in the province, with just 7,000 inhabitants. The Island had a strong economy, built on the farming, timber and shipbuilding industries, and with a merchant fleet that shipped goods around the world. Like other parts of British North America, the Island benefited from the Reciprocity Treaty. It also had strong trade links with the New England states. Despite the health of the economy, however, many Islanders lived and worked on plots owned by absentee landlords, whose exorbitant rents or refusal to sell their property gave rise to many problems. Island politics were characterized by a strong sense of independence in relation to the outside world, and by intense political battles internally. Responsible government came to the Island in 1851. Most men had the right to vote, though no women did. Conflicts in the legislature often arose between the reformers, who were mainly anti-landowners, and the Conservatives, who generally supported the rights of landowners. At the time of the Charlottetown Conference, the Conservative Colonel John Hamilton Gray was premier of Prince Edward Island. George Coles, a former premier and veteran of the fight for responsible government, was leader of the opposition in the Legislative Council. 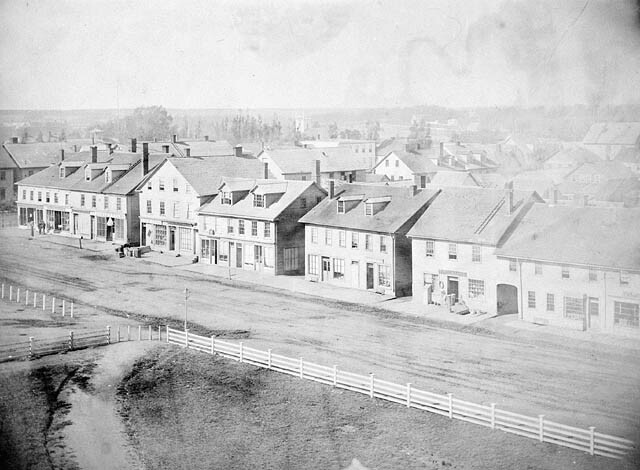 Charlottetown (view of Grafton St. from Province House), 1860s. 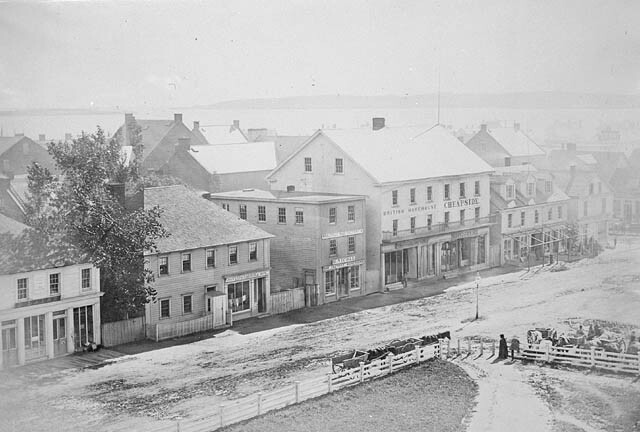 In 1864, Prince Edward Island played host to the Charlottetown Conference. The choice of location was somewhat peculiar, as the members of the Island's delegation were nearly all opposed to either Maritime Union, or the larger union proposed by the Canadians. (It has been suggested that the Island government refused to attend any conference unless it was allowed to be the host.) The Island's delegates were Premier John Hamilton Gray, Attorney General Edward Palmer, Member William Henry Pope, Upper House Reform Leader Andrew Archibald Macdonald, and Lower House Opposition Leader George Coles. Most of the Island delegates initially saw little benefit to joining a united British North America. There were concerns that the province would lose its legislature and control of its own affairs. Edward Palmer, ardently anti-Confederation, went so far as to remind his colleagues that they were only authorized to listen, not to make decisions. However, the Island delegates warmed to the idea of a larger union, particularly after the other colonies suggested a purchase of large land holdings -- financed by the proposed new government -- as a solution to the problem of absentee landlords. Prince Edward Islanders were enthusiastic hosts. The Charlottetown Conference is remembered for its parties, elegant dinners and excursions on the island, all held for the visitors from the mainland. The Canadians returned this hospitality by hosting a luncheon aboard their ship. The final 'grand ball' at Province House was held on Thursday, September 8. It began at ten o'clock in the evening -- dinner was served until one o'clock the following morning, and was followed by several hours of speeches. After the discussions at Charlottetown ended, the conference delegates toured the region, visiting cities in Nova Scotia and New Brunswick. After the favourable discussions at the Charlottetown Conference, representatives from the provinces reconvened at Québec to create a formal union agreement. (The Québec Conference) Thomas Heath Haviland and Edward Whelan joined the Prince Edward Island delegation at this time. The Prince Edward Island delegation's interest in Confederation quickly waned at Québec. The delegation suffered from infighting -- hardly surprising, considering the inter-party animosity existing between its members. Coles and Palmer, for instance, had once fought a duel with each other, and Colonel Gray had ousted Palmer from the premiership only the year before. There were also problems with the agreement that was taking shape; the Island delegation protested the composition of the proposed union government. Perhaps most damaging, however, was the withdrawal of the offer to repurchase land from absentee landlords. As at Charlottetown, there were many social events to entertain the delegates to Québec. Impressions of the dinners and balls can be found in the diary of Mercy Coles, daughter of George Coles, and in the newspaper accounts by Edward Whelan. Still, such events could not iron out the problems faced by the Island delegation or the disharmony among its own numbers. The Confederation debate exploded in Prince Edward Island once the delegates returned from Québec. The Québec Resolutions, established at the conference, were quickly published in a local paper, and received little popular support. Some of the most bitter arguments were within the Conservative government, between pro-Confederationist Colonel Gray, and anti-Confederationist Palmer. Within months both had resigned from the Cabinet over the matter. Coles, the official opposition leader, quickly withdrew his support for union upon returning from the Québec Conference, joining fellow delegates Palmer and MacDonald in opposition to Confederation. Five out of seven Island newspapers were opposed to union, as were many Islanders. Opponents claimed that union with the other colonies would lead to excessive taxation, spending of tax dollars on things that would not directly benefit the Island, and conscription of Islanders for Canadian conflicts. They also feared the loss of the Island's legislature. Although Whelan remained a dedicated proponent of Confederation, with support from a couple of Island newspapers and from William Pope, his efforts were in vain. In December 1864, Whelan wrote that the Island was "dead set against Union in all shapes and forms." In May 1866 the provincial legislature passed the "No Terms" resolution, under the leadership of a new Conservative, anti-Confederation premier, James Pope. The resolution rejected the terms of the Québec Conference and of Confederation. There was one more attempt to sway the Island towards union in the autumn of 1866. It came in the form of a renewed offer to purchase absentee landlord holdings with an $800,000 fund. Samuel Leonard Tilley and Charles Tupper, in London awaiting the start of the London Conference, met with James Pope to make the offer. The offer was viewed as a bribe by many Islanders, and was rejected. After rejecting Confederation in 1866, Prince Edward Island focused its efforts on securing its economic future. That same year the Reciprocity Treaty with the Americans expired, greatly reducing the Island's exports to the United States. To the consternation of the Colonial Office, and the new Canadian government, the Island decided to pursue its own trade agreement with the United States. In 1868, the colony hosted a delegation from the United States Congress. The meetings went well, with the United States delegation presenting a favourable report to Congress. However, the Island legislature, under pressure from the Colonial Office, passed a resolution acknowledging it could not pursue a trade deal without British permission -- something that was not forthcoming. Although Prince Edward Island did not implement an independent trade deal with the Americans, the possibility of stronger ties between Prince Edward Island and the United States concerned Canada. In 1869, the new country decided to try again to convince the Island to join Confederation with a deal known as "Better Terms". In addition to an offer to assume the Island's debts, the deal provided a debt allowance, and an annual per capita subsidy of 80 cents. As well, Canada offered a steamer service to the mainland for delivery of passengers and post, and a renewed pledge of $800,000 to purchase remaining absentee landlord holdings. The government of Robert Haythorne rejected this offer in January of 1870. Following the rejection of the latest union offer, Prince Edward Island embarked on a period of railway construction. James Pope believed that a railway network would generate employment, and provide an efficient means of transporting goods throughout the Island. As well, he believed it would benefit tourism. With wide public support, construction began in 1871. However, concerns soon arose over the mounting cost of the project. A provincial election in 1872 failed to resolve the economic problems; within the year, the government realized that the province faced imminent financial collapse unless help was found. In November, the Island approached the Canadians about joining Confederation; it found the Canadians receptive and willing to discuss terms. In February 1873 Haythorne and David Laird travelled to Ottawa to begin negotiating terms for union. By March, a proposed union deal was put before Island voters in a general election. Although the terms secured by Haythorne were impressive, James Pope campaigned on a promise that he could obtain an even better agreement. He won a majority, and led a new delegation to Ottawa that also included Haviland and G. W. Howlan. They succeeded in gaining even better terms for the Island. When they returned to Charlottetown, a union resolution was put before the legislature and debated; all but two members voted in favour of Confederation. The terms under which the Island joined Canada included those it had sought in Québec in 1864, and more. 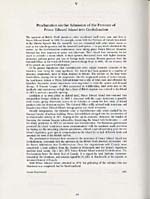 Canada was to assume Prince Edward Island's railway debt; the Island would be given an $800,000 grant to purchase land from absentee landlords, and a grant of $50 per head; a guarantee of continuous communication with the mainland was provided for; and, finally, Prince Edward Island was allotted six members of Parliament, one more than the five they had been offered at the Québec Conference. 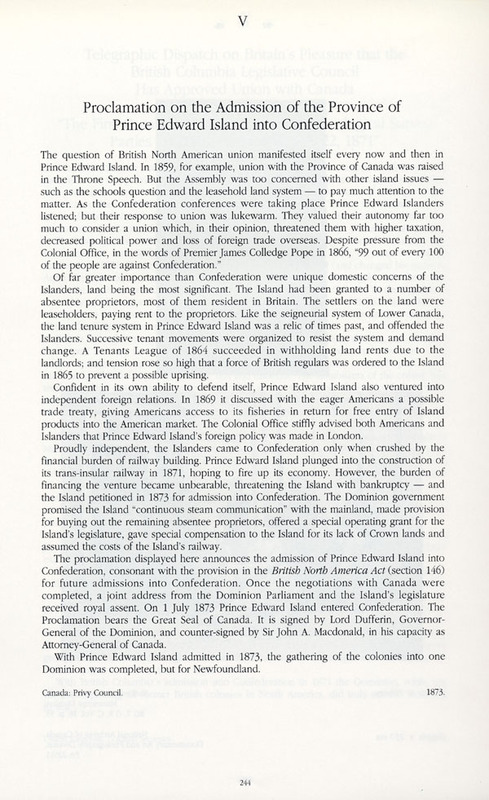 Proclamation on the admission of the province of Prince Edward Island into Confederation. Prince Edward Island joined Confederation on July 1, 1873. Despite their long resistance to union, many Islanders celebrated the day. Buildings throughout Charlottetown were decorated with flags, bunting and streamers; even the ships in the harbour were festooned with ribbons. At noon there was a brief ceremony at the Colonial building, where the union proclamation was read, and the crowd sang the national anthem. Islanders still retained a strong sense of independence, however. When Lord Dufferin visited Charlottetown later that month, he was so impressed by the Islanders' lingering sense of independence, he reported he was "under the impression that it is the Dominion that has been annexed to Prince Edward Island." That summer, James Pope was sent to Ottawa as a member of Parliament. He became the first Islander in the federal Cabinet, acting as fisheries minister for John A. Macdonald. Haythorne was appointed to the Senate. The Atlantic Provinces in Confederation. -- Ed. E. R. Forbes ; D. A. Muise. -- Toronto : University of Toronto Press, 1993. -- 628 p.
The Atlantic region to Confederation : a history. -- Ed. Philip Buckner ; John G. Reid. -- Toronto : University of Toronto Press, 1994. -- 491 p.
Bolger, Francis. -- Prince Edward Island and Confederation, 1863-1873. -- [Charlottetown] : St. Dunstan's University Press, 1964. -- 308 p.
Callbeck, Lorne C. -- The cradle of Confederation. -- Fredericton, N.B. : Brunswick Press, 1964. -- 256 p.
Creighton, Donald. -- The road to Confederation : the emergence of Canada,1863-1867. -- Toronto : Macmillan, 1964. -- 489 p.
Moore, Christopher. -- 1867 : how the Fathers made a deal. -- Toronto : M & S, 1997. -- 279 p.
Waite, P. B. -- The life and times of Confederation : politics, newspapers, and the union of British North America. -- 2nd edition, with corrections. -- Toronto : University of Toronto Press, 1962. -- 379 p.
Weale, David ; Baglole, Harry. -- The Island and Confederation : the end of an era. -- [S.l. : s. n.], 1973. -- 166 p.